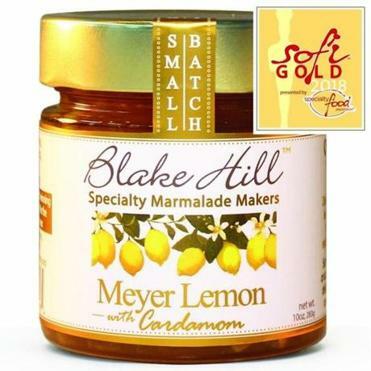 Blake Hill Preserves’ Meyer Lemon with Cardamom marmalade won a Gold Sofi Award from the Specialty Food Association. The Specialty Food Association holds an annual competition and presents awards to recognize distinctive and innovative specialty foods. The year’s winners, selected from 2,650 entries across 39 categories, were recently announced and 14 New England producers got statues; some snagged more than one. But only two others received the top gold accolade, and both were from Vermont — Mount Mansfield Maple Products in Winooski for Organic Single Malt Barrel Aged Vermont Maple Syrup, and veteran winner Vermont Creamery of Websterville for Cremont, a mixed-milk cheese combining cow and goat milk. There were two Bay State winners — past winner Sauces ’n Love of Lynn captured a bronze for pumpkin gnocchi and a new product award for yellow tomato purple basil sauce. Vivra Chocolate from Walpole received a silver for its dark chocolate The Bar, a mix of dried fruits, nuts, and agave nectar. Other Vermont winners include three who earned silver awards: Vermont Creamery for Crème Fraiche, confectioner Vermont Amber in White River Junction for Organic Fennel Seed Toffee, and Sugar Bob’s Finest Kind from Rutland for Smoked Maple Barbeque Sauce. With a gold for the maple syrup, Mount Mansfield Maple Products also earned a bronze statue for Organic Pure Maple Sugar Candy. New product awards went to repeat winner Vermont Creamery for the Clover Blossom Honey Fresh Goat cheese and Runamok Maple of Cambridge for Ginger Root Infused Maple Syrup. From New Hampshire, Wozz! Kitchen Creations, from Bethlehem, has racked up awards in past years and took a silver this time for Indian Spiced Beet Spread. Frescobene of Fairfield, Conn., got a silver statue for Sausage Ragu sauce, and TEA-RRIFIC! from Bridgeport, Conn., which makes ice cream with tea, won a bronze for Masala Chai. From Maine, the Gelato Fiasco of Brunswick was recognized again, this year with a silver for Peanut Butter Gelato. A bronze went to Waterville’s the Maine Crisp Co. for Cranberry Almond Crisps. GrandyOats from Hiram, a first-time winner, earned a new product award for Coffee Crunch Coconut Granola, a grain-free granola. “We are so excited to get the recognition. It’s quite the honor,” says brand manager Zoe Croft. Winners will showcase their products at the Summer Fancy Food Show, a trade event in New York, June 30-July 2. To see the entire list of winners go to www.specialtyfood.com/awards/sofi/winners.